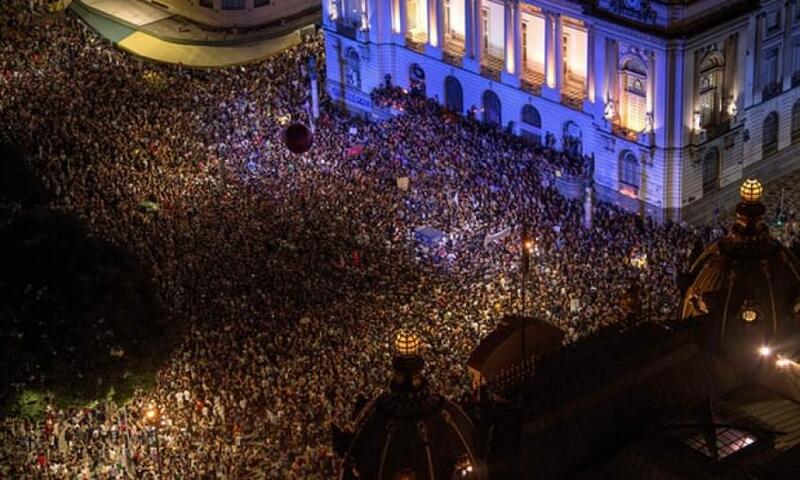 Home / .#Politics / #Human_Rights / #HumanRights / #TrueNews / Brazil / #HumanRghts :At least 1,000 people marched as protest against murder of activist councilwoman and her driver in Rio de Janeiro. #HumanRghts :At least 1,000 people marched as protest against murder of activist councilwoman and her driver in Rio de Janeiro. Hundreds protest murder of activist councilwoman in Rio de Janeiro. Activist councilwoman in Rio de Janeiro. At least 1,000 people marched in Brazil's second largest city Sunday to protest the murder of councilwoman and human rights activist Marielle Franco. Several hundred people took part in a smaller protest rally in Sao Paulo. Franco and her driver, Anderson Pedro Gomes, were shot dead by assailants Wednesday night while returning from an event focused on empowering young black women. Protesters gathered in Rio's Mare slum, where Franco grew up, before marching along Avenida Brazil, the main north-south artery through the city. Several carried banners reading "Marielle and Anderson Present Today and Always." Franco's murder came just a month after the government put the military in charge of security in Rio, which is experiencing a sharp spike in violence less than two years after hosting the 2016 Summer Olympics. The intervention has put thousands of troops on the streets, but doesn't appear to be having an impact. Critics say that's because generals don't have the appetite to take on major components of the violence, such as endemic police corruption and heavy-handed tactics. Rio's police force is one of the most deadly in the world. In 2016, 925 people were killed during operations, according to the think tank Brazilian Public Security Forum. Tallies by human rights groups put the number over 1,000 in 2017.